Meal planning saves time, money, and yes, it can even boost your family’s nutrition. I have a feeling you’ll be printing my one-page 7-Day Meal Planner again, and again, and again! Enter the 7-Day Meal Planner. 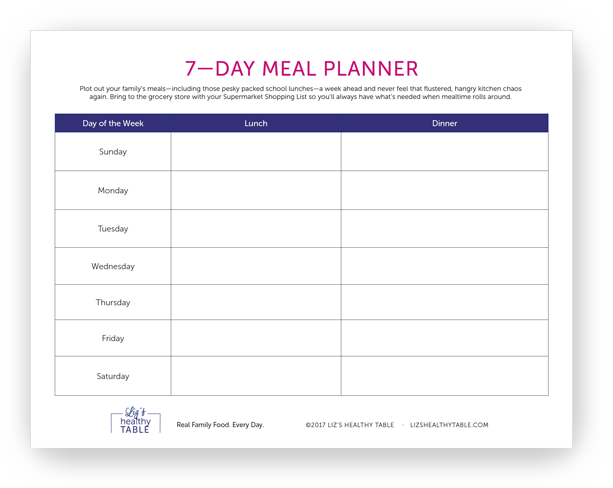 Plot out your family’s meals—including those pesky packed school lunches—a week ahead and never feel that flustered, hangry kitchen chaos again. It’s easy to print out and bring to the grocery store (along with the Supermarket Shopping List). I promise—a bit of planning solves a lot of problems.